Meet Gonggong! Or Holle. Or Vili. You decide. An artist's representation of a generic Kuiper Belt object. 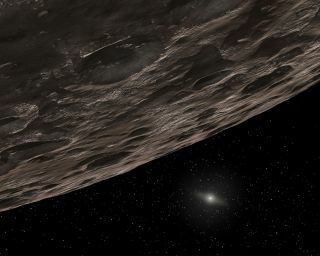 A team of planetary astronomers is asking the public to help name a minor planet designated 2007 OR10, which is the largest unnamed world in the solar system. The public has one month to choose between three semifinalists: Gonggong (a Chinese water god), Holle (a European winter goddess associated with fertility, rebirth and women) and Vili (a Nordic deity who helped defeat the frost giant Ymir). You can cast your vote until May 10 at 8:59 p.m. EDT (0359 GMT May 11). The object's orbital location requires its official name be inspired by a creation deity, according to the nomenclature guidelines developed by the International Astronomical Union, which oversees all names in planetary science. The team also wanted to select names that would accommodate related names for 2007 OR10's moon, should a formal name for that object become necessary. All three contenders for 2007 OR10 are references to deities somehow associated with the color red, the team wrote on the website accompanying the public vote. The deities selected also relate to either ice and snow or to the interior of something becoming the exterior, two themes associated with what scientists know so far about the object's history. The world is roughly 775 miles (1250 kilometers) across, making it smaller than Pluto, and orbits in the Kuiper Belt — a region of small, icy objects beyond the orbit of Neptune. It was discovered in July 2007. Since then, scientists have confirmed it has a reddish surface, suggested it may sport long-dormant ice volcanoes and discovered its moon. The current name, 2007 OR10, is a designation from the Minor Planet Center, an entity that catalogs all solar system discoveries, which added the object to its records in November 2009. Because discoverers have 10 years from the time a world is numbered to submit a name, the team decided to act before the deadline in November 2019. Once the object receives a formal name, it will join the company of other well-known minor planets, like Haumea, Makemake, Eris and Sedna.